A few newsletters back Alex was featured in a story on gnarly Amazons, calling for adoptive homes for these birds. The great news is that only 3 months later, all six of the Amazons were adopted. But since Alex was not, we thought we'd revisit this very special bird. 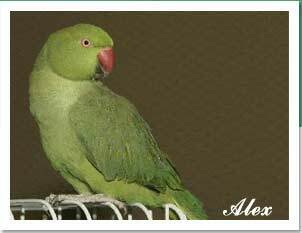 You see, Alex is special in that she has been with Mickaboo longer than any bird currently being fostered. Oddly, the bird who has been fostered with Mickaboo the second longest is also a Ringneck, Asia. 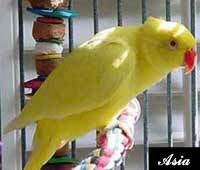 Asia is a lovely bright yellow Ringneck who has a bonded buddy, the beautiful green Sidney. These beauties came to Mickaboo from an aviary, and so are a bit shy of humans. But even birds who do not want close interaction with their humans can be delightful members of the family. Ask any parent of finches or perhaps canaries. 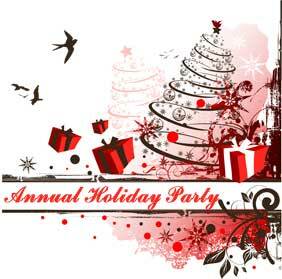 Mickaboo's Annual Holiday Party is our favorite event - a place and time to celebrate past successes and set the stage for our future! This year's event will feature the usual great food, drink, offerings of donated items, AND, for the first time, a make-your-own-bird-toy activity - so you can custom-make that special present for your favorite feathered friend! For more details and to make your reservations, go to Mickaboo and click on the "Mickaboo 2009 Holiday Party" link on the left. Want to donate an item or service, or help sponsor the party? Contact Mickaboo to make arrangements! The German composer Georg Philipp Telemann wrote a funeral cantata for a singing canary that was killed and eaten by a cat. 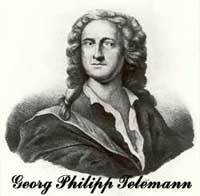 Telemann (1681-1767) was the most popular composer in Germany during the first half of the 18th century. His fame eclipsed even that of his contemporary J.S. Bach. Help us choose which photos to feature in our 2010 Calendar! Go to the start of the photo display pages here to see our pictures and vote on them! Please notice – some of the photos are numbered out-of-order, just to make sure you’re really looking at them. Email your votes to pr@mickaboo.org with subject line "2010 Calendar Vote", like this: African Grey- photo number; Amazon -photo number, etc. 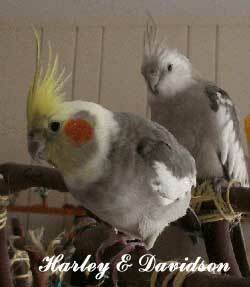 For example: African Grey - #3, Amazon - #2, Budgie - #1, etc. Voting ends at midnight, Oct 22, so we can publish the calendar for your holiday gifting pleasure. The 2010 Calendar will be available at Mickaboo's Cafepress Store. Email questions to pr@mickaboo.org! 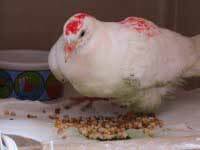 On 7/20, MickaCoo received an e-mail from San Jose Animal Care & Services saying that they had an ink-marked king pigeon they were hoping we could take. I and the few fosters were full up and I asked the shelter to hold him, for two weeks if possible, as there were some adoptions in the works and I was hopeful a spot would be open by then. We first tried foraging after our blue-crown conure started feather chewing. Our avian vet suggested we try foraging as a way to distract him from his tasty feathers. The foraging was quite successful in getting our obsessive little guy to stop feather chewing almost immediately. All of our birds now adore foraging. Here are some techniques we’d like to share. In our last Newsletter, we featured 6 cockatiels (3 single birds and 3 bonded pairs) who were among Mickaboo’s longest “residents.” I am pleased to announce that the 3 single cockatiels have been adopted into their forever homes!!! Congratulations to Leon, Norman, and Freeway and to their new adoptive families. 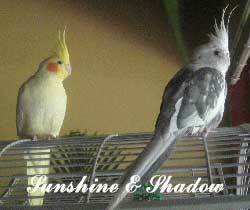 Unfortunately, two of the remaining cockatiels from that Newsletter have crossed the Rainbow Bridge. But Shadow and Sunshine, and Harley and Davidson are still available. Contact cockatiel-coordinator@mickaboo.org if you are interested in meeting them and giving them a loving forever home. Bird songs being the inspiration for pre-language chants. We all love listening to the beautiful sounds of bird song, either from our own companion birds or the wild residents of our neighborhoods. Now, a new theory of language proposes that early humans didn't just listen to bird song for pleasure. In fact, birds may have inspired one of the first forms of structured communication between humans. In the PBS series "The Story of India", historian Michael Wood visits Kerala, an ancient area in southwest India where residents trace their genetic origins back 30,000 years. Here, Brahmin priests chant using sounds that predate any known human language -- sounds that more closely resemble patterns found in bird song. Like bird song, the Brahmin chants follow set patterns, repeating refrains in ways that are not seen in any modern language. The only analogues that exist are the songs of native birds like the Black Flycatcher. Frits Staal, Professor Emeritus at UC Berkeley has written on “Mantras and Bird Songs” in chapter 23 of Rituals and Mantras: Rules without Meaning. There he discusses a song sung by the Black Flycatcher, examining phrases consisting of a few notes which he sees as comparable to the units of the mantras. Common patterns have also been found between mantras and the songs of Blyth’s Reed Warbler and the Whitethroat, two birds that migrate to India and are thought to have influenced the mantras. While Staal admits that he is not an ornithologist, he recognizes the wealth of information on the subject of bird songs, including Born to Sing (1973) by Charles Hartshorne, who is both an ornithologist and philosopher. The meaning and influence of bird songs continues to be a topic rich in both controversy and wonder. One implication still to be explored is perhaps the most exciting for bird lovers: if, 30,000 years ago, humans were communicating as birds do today, our feathered companions may be only a few millennia away from developing their own true language. So what is it about parrots’ behaviors? We all have been enthralled, entertained, and sometimes disturbed with our feathered friends’ behaviors. 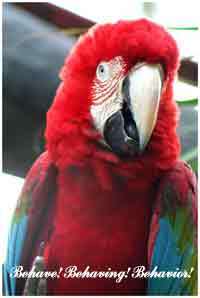 I love watching Dewey, our GW macaw, fly and do mid-air acrobatics. He seems to have so much fun learning another twist, dive, and stall routine. I am comforted seeing my macaws ruffle up their feathers after a nice scritching. At the same time, I am deeply torn when I see them fearful or aggressive. It is all these human emotions that I go through on a day-to-day basis with my companion macaws.